The story of the Bullhearts warrior chamber continues on in the first installment of a new Age of Sigmar audio drama series. David Guymer takes over the reigns as Ramus is sent back into the realms to hunt down Mannfred and bring him before Sigmar's judgement for his betrayal. Will he find the vampire, or something else? I was beyond excited when I found out that the story arc from Josh Reynolds' series was continuing on, this time in the hands of David Guymer. The audio opens with Ramus, the Lord-Relictor of the Bullhearts, being reforged in Sigmaron. I always love these scenes that give us a bit more of an in depth look at the Stormcast and everything involving them. Their reforging is definitely an important part of their identities within the AoS universe. From what I heard here it sounds like a rather painful and traumatic process as he struggles to hang on to what makes him himself. Now filled with anger at the betrayal of Mannfred and the loss of his Lord-Celestant Tuarsus against Nagash, Sigmar sends him back into the realms, it seems almost immediately, to hunt down the vampire. That was all before the title of the drama is even announced. Once down in the Realm of Beasts, Ramus finds himself with a small group of Stormcast, similarly reforged, in what appears to be giant arboreal city. From how it was described I was picturing something similar to the Ewok's village, but on a gigantic scale, and of course without any small teddy bear people. 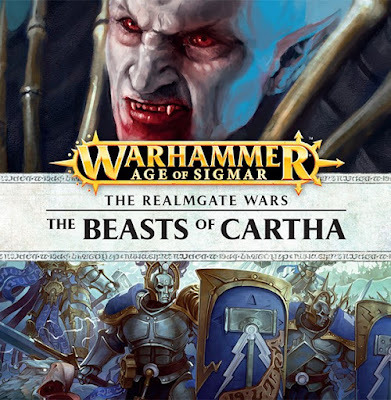 They are quickly discovered by another group of Stormcast belonging to the Astral Templars who have been garrisoning this area, known as Cartha. The Astral Templars themselves are pretty awesome. They are somewhat feral, with furs, trinkets, and tribal markings all over their armor. They also have the attitude to match, being boisterous and headstrong. I think they may be the most human Stormcast I have seen so far. The Stormcast are not alone though, and they also have contingents of mortal warriors serving under them. This is another cool dynamic to see since it's the first time we really see the Stormcast interacting with allies from Azyr. Pretty quickly we are thrown into a battle against a tribe of Ogors who are "migrating" through the area. All of the battles were a ton of fun to listen to and very engaging, I think we may have even gotten a few sneak peaks of new Ogor units too. After the first battle is done we get some nice quieter moments as the Templars show Ramus' group around the city. The Astral Templar's leader is Hammercarl, a Lord-Castellant with a pretty big personality. For people familiar with 40k, think of the Space Wolves, but friendlier, and you aren't far off. The stakes really start to get raised once the leader of the Ogor's makes himself known, Mannfred himself. I don't want to give away much more of the story, but the final battle scene is pretty great, and it doesn't go the way you would exactly expect it to. I am definitely looking forward to more interactions between Ramus and Mannfred since the pair never liked each other. There is also a moment that makes me question how much time has passed between when Ramus died against Nagash and this story. I really loved Beast of Cartha. It does a great job of introducing a new Stormhost to us, and one that is unique and unlike any other group we have seen yet. It also does a really good job of continuing the same story from Josh Reynolds' audio dramas but with a new and different feel to them. The realm of Ghurr definitely feels different the Shyish. All of the voice acting was top notch, with the Astral Templars being the stand outs for me, and the music and sound effects were great in setting the mood of being in a forest city miles above the ground. I highly recommend picking this up, especially if you were a fan of the last four audio dramas. While you could conceivably start with just this audio drama, I would recommend listening to the past ones first to get the most out of it.